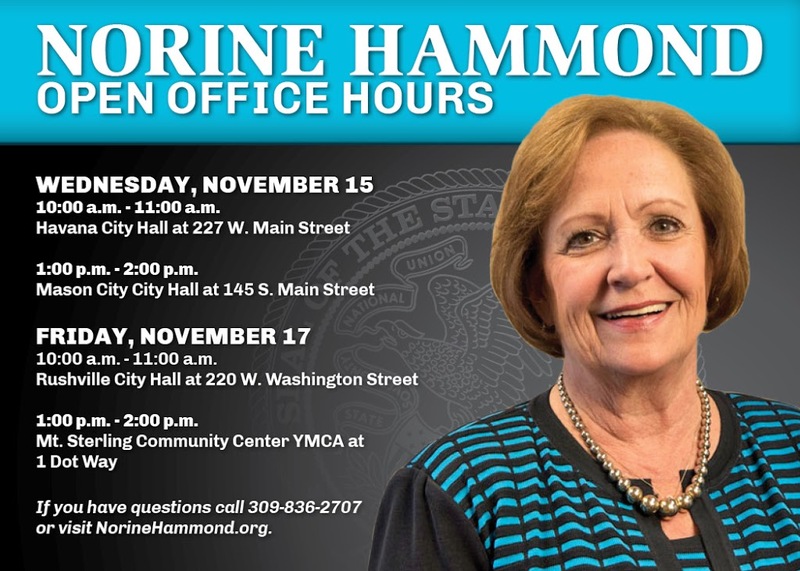 MACOMB –Assistant House Minority Leader Norine Hammond (R-Macomb) will hold ‘Open Office’ Hours in Havana and Mason City on Wednesday, November 15 and in Rushville & Mt. Sterling on Friday, November 17th. Wednesday, November 15- 10:00am-11:00am- Havana City Hall at 227 W. Main St.
Wednesday, November 15- 1:00pm-2:00pm- Mason City City Hall at 145 S. Main St.
Friday, November 17- 10:00am-11:00am- Rushville City Hall at 220 W. Washington St.